Social crises don't suddenly appear out of nowhere; they develop step-by-step. 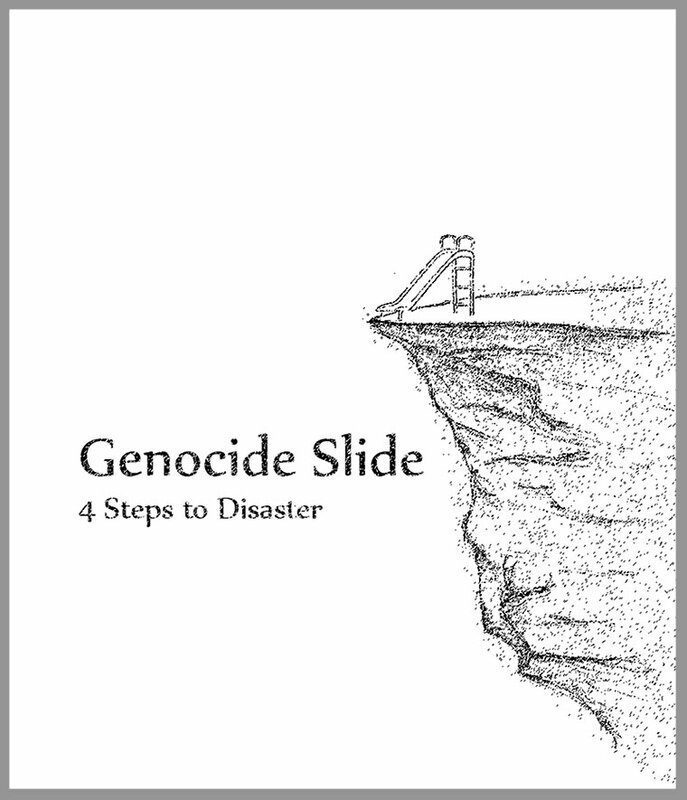 The Genocide Slide is a tool used to measure these steps. The first step down the Genocide Slide occurs when people are grouped together. People are commonly grouped together in many ways – by age, by occupation, by ethnicity, by blood type, by income, by anything. Although grouping can be useful, it is also the necessary first step to something horrible. All grouping creates division – division between “members” and “non-members”, between the “in’s” and the “out’s”, between the “we’s” and the “they’s”. VIOLATORS: We violate Step 1 when we unnecessarily group people together or cause another person to feel unwantedly grouped. We also violate Step 1 when we support organizations that are not diverse. OBLIGATION: It is our obligation to avoid unnecessary grouping. It is our obligation to avoid using words that unnecessarily identify groups. And when physical differences are apparent, it is our obligation to support and practice diversity. It is our obligation to keep ourselves and our children totally off the Genocide Slide – far away at “Step Zero” where the world is an ungrouped family. The second step down the Genocide Slide occurs when people of any group are avoided or spoken of in a negative way. This includes jokes. Joking and making negative comments about a group creates hard-to-erase stereotypes. Avoidance of others is unhealthy because it perpetuates ignorance. It’s mixing and open communication that keeps a person and a society healthy. VIOLATORS: We violate Step 2 when we avoid people who are different from us, when we joke about them, when we speak poorly of them, or when we cause them to feel that we are doing these things. OBLIGATION: It is our obligation to never laugh at or show approval of a demeaning joke or comment about a group. It is our obligation to openly mix and communicate with people from other groups to prevent stereotypes from taking hold. The third step down the Genocide Slide occurs when disgust or hatred is expressed towards a group, when they are referred to in nonhuman terms (such as “insects” or “enemies”) or when they are denied access to the same fruits of society that others enjoy. VIOLATORS: We violate Step 3 when we express disgust or hatred towards another group, or when we refer to them in nonhuman terms, or when we allow social doors to close on them, or when we cause them to feel that we are doing these things. OBLIGATION: When we observe any Step 3 hatred, we have an obligation to counteract the violation, immediately and publicly, so that those who hear the hate can be empowered by its rejection. It is our challenge to do this in a way that will heal and free (instead of harden and trap) the violator. It is the job of our schools to teach students how to rebuke Step 3 violators effectively but kindly. People who engage in or incite physical attacks against those they perceive to be in another group must be quarantined from society until they are no longer consumed with such hatred. Like viruses, hatred spreads and infects others. The contagion must be stopped. VIOLATORS: We violate Step 4 when we directly or indirectly endanger the safety or well-being of someone in another group, or when they feel endangered as a result of our actions or lack of action. OBLIGATION: It is our obligation to stand up like a wall and block all violence and all incitement to violence. If the police and court system are the most effective way to achieve this, it is our obligation to contact the police and to testify in court until the targeted group is safe and the attacker is confined and given the chance to grow in a different direction. The "Genocide Slide" is only one of the three tools that "active pacifists" use to change society through nonviolence (as described in the story "Aren't We the Lucky Ones" by Secretary Michael). The other tools are the "Incompat" and the "Fountain-Flush". engineered to tear down walls between people.